Remember way back in January when I was complaining that we hadn’t gotten any snow yet? Well, I guess the joke’s on me. After a winter with over 63 inches total (nearly twice the average amount), much of which just kept piling up on top of what the last storm left (read: we’ve literally had snow on the ground, continuously, since the end of January), the first day of spring started off with more of the white stuff. And then it snowed ALL DAY on Saturday. My drive to work was a snowy one yesterday and we’re expecting more this week – you know, in the week leading up to Easter? When daffodils and hyacinth and tulips reign supreme? Yeah…there haven’t been any daffodils popping up here yet. 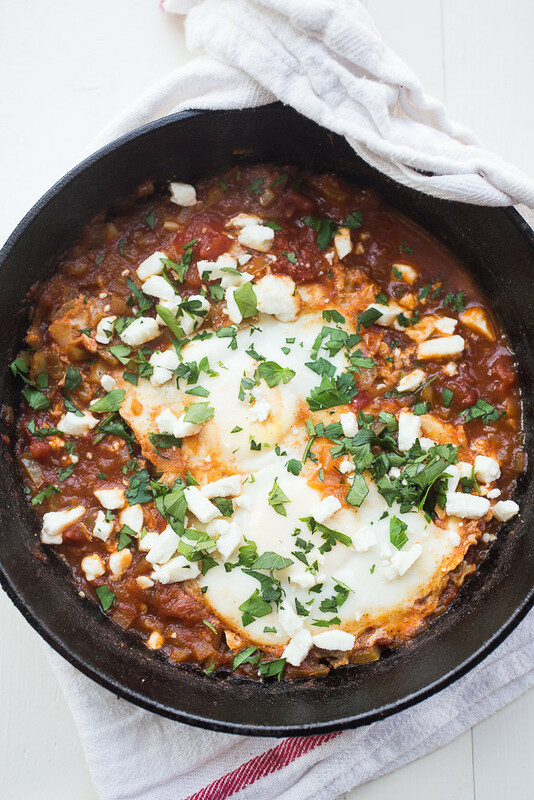 So this egg dish, shakshuka – or more commonly known as eggs in purgatory – is definitely a fitting meal for this crazy weather we’re having, both because the eggs are nestled and poached in a warmly spiced and fiery hot pepper and tomato sauce that just screams cold winter meal and because, you know, New England sort of feels like being caught up between two worlds right now. 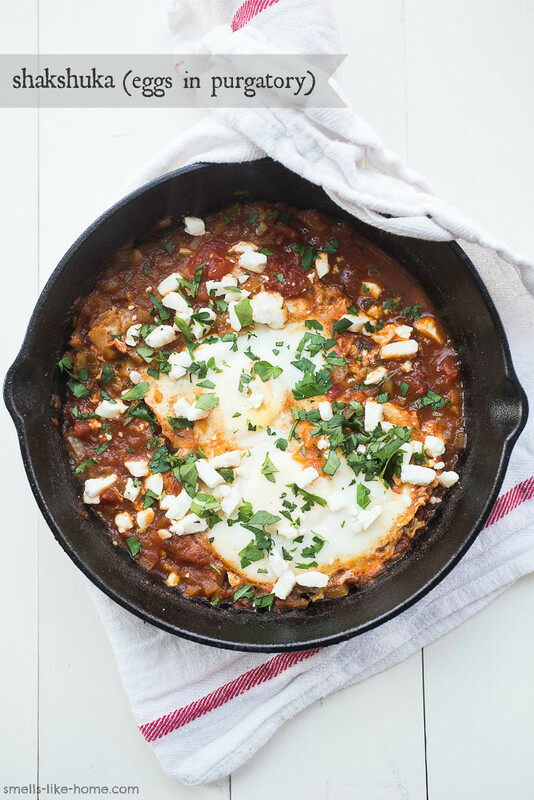 Some salty feta cheese gets added to the top of everything and perfectly balances the dish’s complex flavors. Hopefully one day soon I’ll have a new grillin’ and chillin’ recipe to share with you but for now, this one is juuust right. Pour the tomatoes and their liquid into a large bowl and gently break them up with your hands; set aside. Heat the oil in a 12-inch skillet over medium-high heat and saute the chopped peppers and onions for about 5 to 6 minutes, until they have softened. Add in the garlic, cumin, and paprika and stir for about 1 minute, until fragrant and the garlic is soft. Turn the heat down to medium-low and add the tomatoes, all of the tomato liquid, and the water to the skillet. Simmer the tomatoes, stirring occasionally, until the sauce has slightly thickened, about 15 minutes. Season with salt to taste. Break the eggs over the sauce. 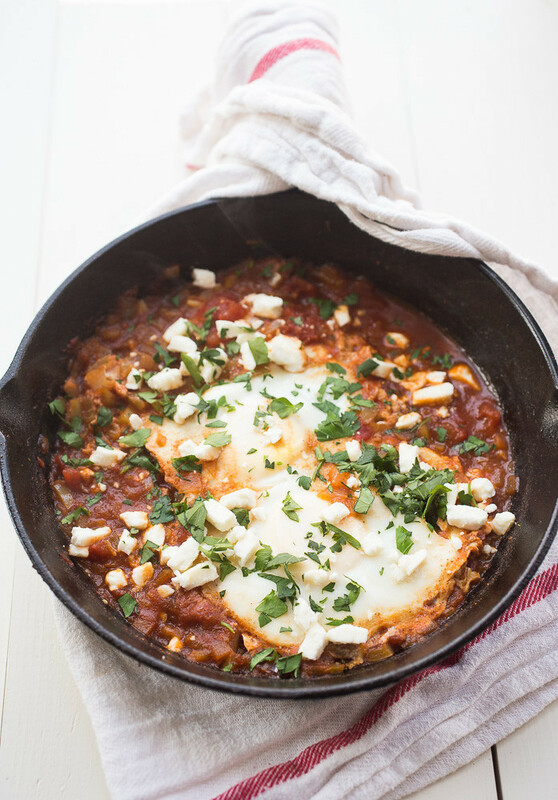 Cover the skillet and allow the eggs to cook until they are just set, about 4 to 5 minutes. 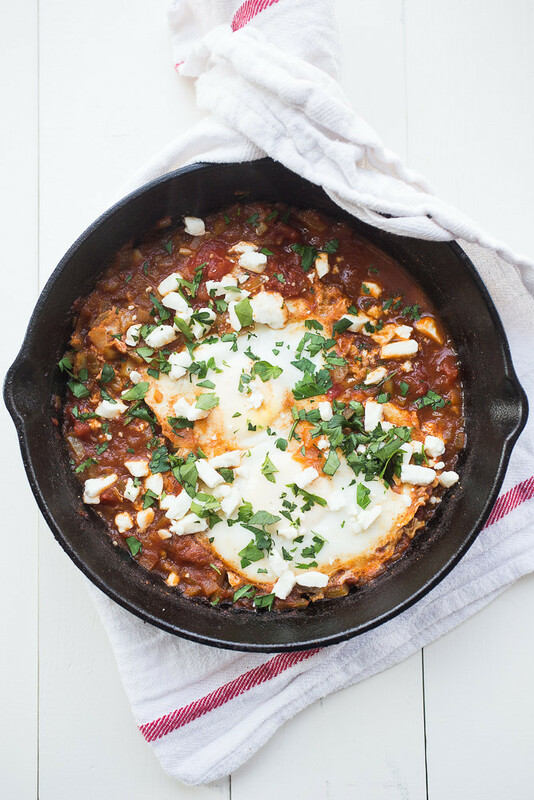 Spoon some of the sauce over the eggs, sprinkle the feta and parsley/cilantro over the eggs, and serve while still hot with warm pita or crusty bread on the side.